That’s my thoughts as I am sitting here in the drive-thru at the BK. A few years ago, they slapped some cheese and sauce on their oblong chicken sammich and called it done. It was barely okay. Just barely. This looks like a revamp and serious attempt at a proper chicken parm sammich. Did I mention I love chicken parm sammiches??? Cause I totally do. I have been a big fan of BK for so long…I want them to have a win….and I say that because I have been less than impressed with them for the last several years. That being said, this is probably the best item I have had at a BK in years. 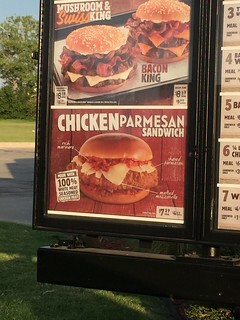 The bun is soft, the sauce is tangy, the two cheeses bring texture and flavor, and the chicken is crispy and crunchy. It’s a great little sammich. And that is what bothers me. It feels like it doesn’t live up to the $5 dollar price tag. At $4 I would love it. But it’s smaller than a whopper and feels like I am spending alot on a little. Still good tho. Check it out and report back below!